The reigning national road champ captured U.S. cycling's biggest prize after years of near misses. If at first you don’t succeed, try, try, and then try again — just ask Coryn Rivera. Rivera’s emphatic victory at USA Cycling’s elite road national championships this past summer came after three straight years of finishing second place. Of course, Rivera has been trying her entire lifetime. Now 26, Rivera is America’s top rider within the European peloton. She began cycling at age eight and has won 72 national titles since. A native of Southern California, Rivera took part in her first race, following a dare, at the Redlands Bicycle Classic. She won. She quickly fell in love with the competitive dynamics and intensity of bicycle racing. 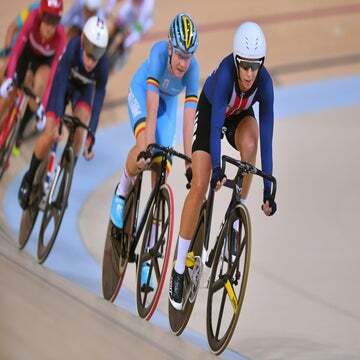 At age nine she competed in her first USA Cycling-sanctioned race, the Los Angeles Circuit race. Rivera had early success at USA Cycling’s national championships. She won her first two national titles in 2005 in Park City and began accumulating national championships after that. Rivera credits much of her WorldTour success to her development days in Southern California. She joined the Major Motion team, a junior racing team that had older, more established riders, such as Alexis and Kendall Ryan, and Corey and Justin Williams. Rivera loved the fun and camaraderie of club racing and spent her weekends doing group rides. Rivera learned lifelong cycling skills within SoCal’s thriving criterium scene. The fast and furious races taught her how to navigate the peloton and handle her bicycle. Her legs and lungs developed with age, but these races helped teach her invaluable lessons that often derail younger pro riders. Rivera has already scored impressive victories in Europe. In 2017, she became the first American, man or woman, to win the Tour of Flanders. Rivera undoubtedly has plenty of amazing wins to come. She says she’s still fueled by the same passion that pushed her when she was a child.